The channel's rebrand in July 2008 saw Lucy and David Eades brought together for a double-headed presentation at 10.00 GMT. The programme changed from its regular half-hour format to an hour-long show broadcasting more live events and breaking news. 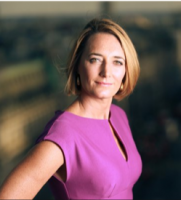 Lucy joined BBC World News as a producer in 1999, before being promoted to senior producer in 2000. Working on the channel’s news bulletins and two programmes, Asia Today and HARDtalk, she was involved in the reporting of major world events such as the September 11 attacks and the Afghan and Iraq wars. Lucy loves to travel. One of her greatest adventures was a year-long working trip around Asia, visiting Thailand, Cambodia, Vietnam, China, Tibet, Nepal and India.